Sunflower Place is a boutique style accommodation located near the middle of Silom Road in downtown Bangkok. 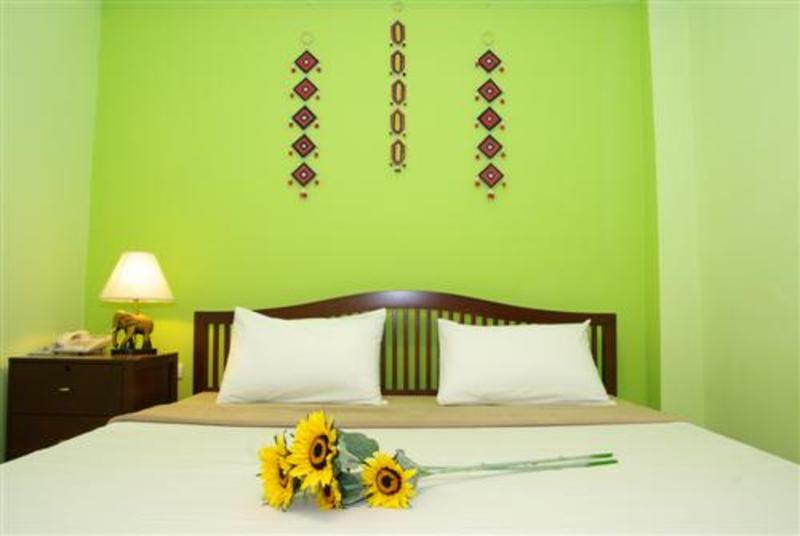 Just a block away from Silom Road, the Sunflower Place is located in a quiet alley where travelers can escape the bustle of the city and enjoy the convenience and peacefulness that we have to offer. We pride ourselves with our clean, cozy and comfortable atmosphere that we provide for your relaxation while in Bangkok. All rooms are designed and setup to make our guests feel like they are home, from an air-conditioner, television, refrigerator, balcony and a wireless connection in each room to a private bathroom with 24-hours hot shower for your convenience. Our friendly and English speaking staffs are willing to serve you throughout your stay. Located just 5-8 minutes walk from the city's skytrain BTS Sala Daeng station and MRT subway Silom station, it is very convenient to reach out to most of Bangkok's major shopping, sightseeing attractions and entertainment. Two comfortable single-beds room with private bathroom and balcony. Each room has air-conditioner, TV, refrigerator, 24-hours hot shower, towels and free WiFi access. A King-size double bed with private bathroom and balcony. Each room has air-conditioner, TV, refrigerator, 24-hours hot shower, towels and free WiFi access. One comfortable single-bed room in 22 sqm room with private bathroom and balcony. Each room has air-conditioner, TV, refrigerator, 24-hours hot shower, towels and free WiFi access. Three comfortable single-beds room (no bulk-bed) with private bathroom and balcony. Each room has air-conditioner, TV, refrigerator, 24-hours hot shower, towels and free WiFi access. -Go to Airport Rail Link counter on level G. Take SA City Line (fare around THB 45 and takes around 30 minutes) to Phayathai Station (end of the line), and transfer to (N2) Phayathai BTS Station. -Continue by BTS to Siam Station and transfer to Silom BTS Line(fare around THB 20 and takes around 10 minutes). -Get off at (S2) Sala Daeng BTS Station (take Exit No.1). -Please refer to 1) above for walking direction to the hostel. -Ask the taxi to go to Surawong Road. Then at the big tri-section turn into Narathiwas road. -Turn left at Soi Narathiwas 1, then continue until passing two Condominium (Surawong Condominium and Green Point Condominium). -After Green Point Condominium, turn to first alley on your right into small alley and you will find Sunflower Place on you right at the end of the alley. Taxi fare: meter taxi fare plus THB50 airport surcharge and express way fees. Total cost approximately ~THB 400. Or By MRT: get off at Silom MRT Station (take Exit No.2 and cross the road to the opposite site). -Then continue walking down to Silom Road until you reach Silom6 Street. -Turn right into Silom6 Street until reaching Thai Prime Massage Store. -Turn left and continue walking toward Green Point Condominium, you will find Sunflower Place on your right.